You’d think that with the advent of Skype and Wap phone, ham radio would be sucked into the black hole. But think again, because the analogue radio is alive and kicking as a toy for radio-heads. The radio beeps and displays the word, “Pradas”. Pushing a knob on the ham radio (amateur radio) set, I launch my first ever call. Sharing a table with me outside a banana-yellow shipment container-turned-ham shack in Jalan Klang Lama are 10 or so hams (amateur radio operators), all members of Persatuan Peminat Radio Komunikasi Dua-Hala Selangor (Pradas), the only registered two-way commercial radio club in Malaysia. Female ham enthusiast Noorasmawati Mohd Adnan. “We take pride in teaching newcomers the ropes to get them started in the hobby,” says the club president, Major (R) Zakaria Utin, or Pak Zak, 54. Pradas provides training to prepare members for the Radio Amateur Exam (RAE) set by the Malaysian Communications and Multimedia Commission (MCMC) to earn a class B licence. They have fun doing it with a free flow of coffee, tea and food. “We teach the operating principles, radio technology, regulations, etiquette and Q-codes (a series of three-letter codes for common phrases),” says Zakaria. 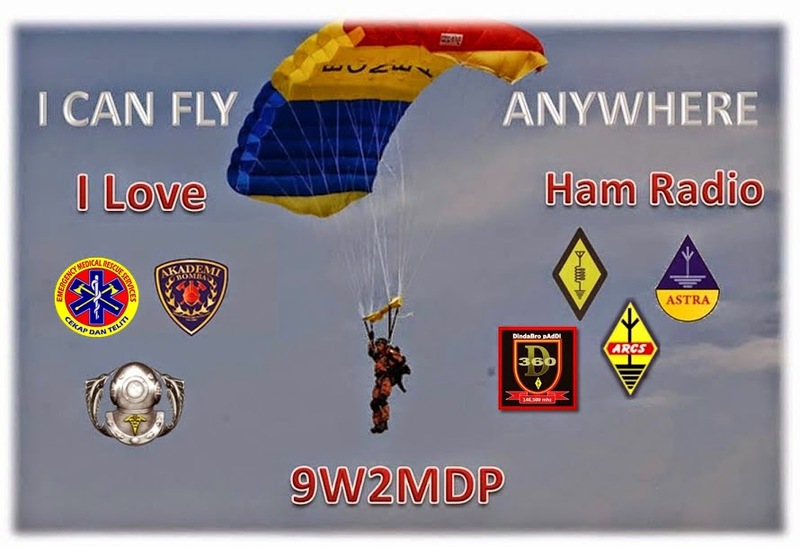 Thankfully there is only a handful of Q-codes you really need to know in day-to-day ham speak, like QTH (What’s your location?) and QRZ (Who is calling me?). Pak Zak, a former military man, has been tinkering with ham radio ever since he joined the ranks and still gets a buzz remembering those days. “In the 60s, ham radio seemed almost magical. There was no Internet, long-distance telephone calls were expensive and air travel was limited. Hams provided emergency communication during disasters and played an important role in military communications during World War II,” he relates. While it may sound antiquated, ham radio is nowhere near life support just yet. “What’s not to love? It’s a tool that takes life-long learning — studying for the licence, trying out new gadgets, testing new transmissions. There’s plenty of excitement, including taking part in contests, meeting other hams at eyeball events and making new friends in all parts of the world. But why would anyone need a big antenna and radio equipment to communicate when you can talk to someone on the opposite side of the globe using a computer, a web camera and a microphone? Apparently for the same reason that we have a pestle and mortar, when there’s already the blender. “Hams are self-contained. We don’t rely exclusively on network providers for communications. You can talk all you want and not be served with a fat bill at the end of the month!” says Pradas vice president and lead steward for a commercial airline, Ismail Yusof, 44. On top of that, hams can go where handphone users can’t. Scouts showing their adeptness at using the two-way radio. Pradas, explains Ismail, has been allocated its own frequency station (142.8000mhz) by the MCMC for communication amongst its members. “Members are given a call sign, which is a unique designation. The Pradas call sign is made up of the prefix Papa Romeo (PR) and a suffix that may contain two or three letters. My call sign for instance is PRIY,” says Ismail. Having trouble with the car? Broadcast an SOS, and hams in the area are most likely to come to your rescue. Many hams, like Pak Long, are cabbies and would be glad to help if you need a ride, or simply could use some directions to find your bearings on the road. “I’m on the road half the time, and tuning into the ham frequency keeps me amused,” says Pak Long, whose real name is Ahmad Safri Abdul Aziz. “Some of my passengers also enjoy listening to the broadcast and a few even asked whether it’s a DJ on air,” says the 45-year-old. His family members are also hams. Cindy Khoo’s first contact with Pradas happened by chance. “I got myself a portable VHF radio to communicate while on treks in the jungle because I couldn’t get a signal on my handphone,” says the 37-year-old team-building consultant. “One day, I was listening in when I overheard someone announcing a Pradas membership drive at Lake Titiwangsa, Kuala Lumpur. I quickly drove over to sign up and later attended pre-exam classes conducted by the elmers. In November 2007, I earned my Class B licence,” she relates. Also known by her callsign, PRCJ, Cindy often tunes into the frequency while travelling around the country for work. “I’ve made many friends from all over Malaysia through ham radio. I was in Ipoh some time back when the back window of my car shattered. I asked the other hams for the nearest police station, and to my surprise, a few hams took the trouble to come over to make sure I was OK,” she says. Given the gadgets kids are exposed to these days — handphones that can do anything but water a plant — most would look at a ham radio and yawn, but not so for Pak Long’s son, Aizat, 17. “It doesn’t matter whether you’re 17 or 87 — on the band, everyone’s equal,” says Aizat. “I get to speak to people of all ages and professions. The friends I’ve made have also helped me in making educational choices,” says the fifth former who aspires to become a chef. “I’m a chatty person by nature so making conversation, even with adults, comes easy to me. But there are hams who’d just tune in to listen and not utter a word because they’re shy. The trick is to just think of everyone as family. Soon, it’ll come easy,” Aizat advises. So why isn’t he on Facebook like other people his age? On Thursday evenings, the Pradas frequency is taken over by what Pradas members call XYLs and YLs — ex-young ladies and young ladies. “It’s a women’s only session, where we get together share stories and ideas,” says Noorasmawati Mohd Adnan, 36. “My husband and I are both hams,” says Zaharah Ahmad, 41, a mathematics lecturer at a private college in Puchong. “When we’re both on the band, we address each other as Kak Lang and Pak Husin. Of course, off air, we use other terms of endearment for each other, but by calling him Pak Husin, it’s an automatic reminder to myself that ham radio is not a platform to engage in private conversations. People can listen to you talking, and you can’t tell who’s listening unless they say something,” she says. Zaharah also encourages her students to become ham members. The ham radio fraternity worldwide, according to recent statistics, number six million people. In Malaysia, there are only 5,000 hams, compared to 7,000 in Indonesia. “The magic of ham is not gone, but it has gone into hiding,” says Ismail. “To expose people, especially youths, to this hobby, we have arranged demonstration booths at public events and schools. “Our club is one of the most active in the country. Members meet up regularly for social and recreational activities like 4X4 adventure tours, paintball and cycling. Last year, 196 Pradas members cycled from Klang to Ipoh, and in May, we’ll be cycling from Banting to Malacca,” says Ismail. Those with a competitive streak may also like the idea of “fox hunting”. Fun and games aside, amateur radio also has a serious face. “In the past, when catastrophe wiped out telephones and Internet networks, hobbyists have stepped in to pass health and welfare messages,” says Ismail. All these make ham radio more relevant today than ever, but its main appeal is that you get to communicate with some of the friendliest and sharpest bunch of people. Hams are people with a lot of dedication and passion. And who knows, maybe someday your amateur radio contact may be Dr Sheikh Muszaphar Shukor, the astronaut. He is a licensed amateur radio operator too! Pradas membership is open to Malaysian citizens over age 14. However, those below 21 must get written consent from a guardian. Visit www.pradas.org.my to download the membership form and find out more.